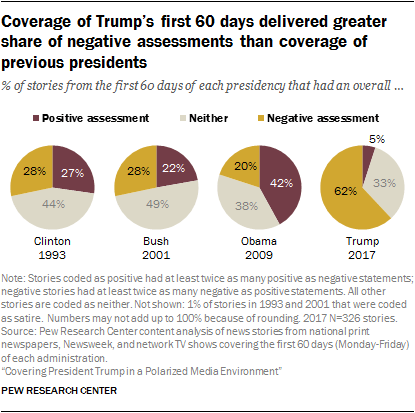 The media’s coverage of President Trump has been overwhelmingly negative, more than three times more critical than the initial coverage of former President Barack Obama and twice that of former Presidents George W. Bush and Bill Clinton. The Pew Research Center said that the early coverage of Trump was 62 percent negative. By comparison, Obama’s coverage was just 20 percent negative.